Amateur dramatic performances, visiting among friends, and general merrymaking characterize the first day of the New Year, which generally is observed as a quiet holiday. In some places roast goose with chestnut stuffing is traditional to the day. Goose necks, filled with ground giblets, seasonings and other ingredients, are a favorite delicacy when thinly sliced and served with between-meat snacks. Housewives vie with one another in making special New Year's bread rich with milk, butter, eggs, and raisins, while birewegge, or pear pie (which looks like a shiny loaf of bread and has a rich filling of pears and raisins) is a popular seasonal treat. On New Year's morning children love to hide and pounce out at startled elders with the first "Happy New Year" greeting. The boys and girls then start village rounds to homes of relatives and friends. After singing "Good day and good cheer" and inviting largess, the children are asked inside and treated. 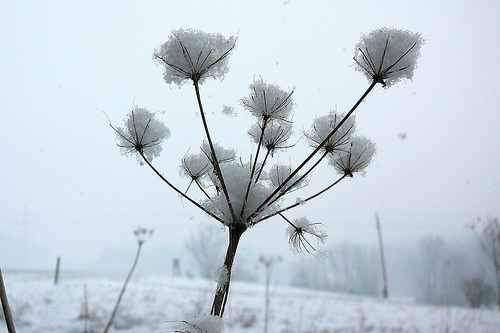 In peasant lore January first is associated with all sorts of omens and predictions. A red sky, for example, signifies storms, fire, and war in the coming year. In some places meeting a woman the first thing on New Year's Day is thought to bring bad luck, while encountering a man or a child is looked upon as a good sign. In many areas the second day of January is devoted to gay neighborhood parties in which nuts play an important part. In early autumn children begin hoarding supplies of nuts for Berchtold's Day, when they have "nut feasts." 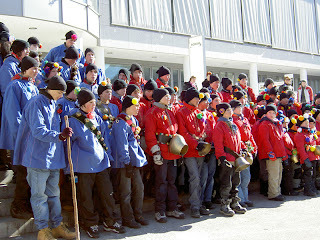 Nut eating and nut games, followed by singing and folk dancing are features of these Berchtold Day gatherings. One favorite stunt of the boys and girls is to make "hocks." Five nuts make a hock--surprisingly difficult to construct--four nuts placed close together, with a fifth placed on top. In Bellinzona, Locarno, and other towns and villages throughout the canton of Ticino, the ceremony of Blessing the Animals is an important rite. Owners curry their horses, mules, and donkeys until their coats shine, then adorn the beasts with bells and ribbons and take them in procession to church. Often the family dogs attend the parade, barking and jumping joyously as the larger animals are driven in state toward the sanctuary doors. The strange communicants wait at the doors until after Mass. 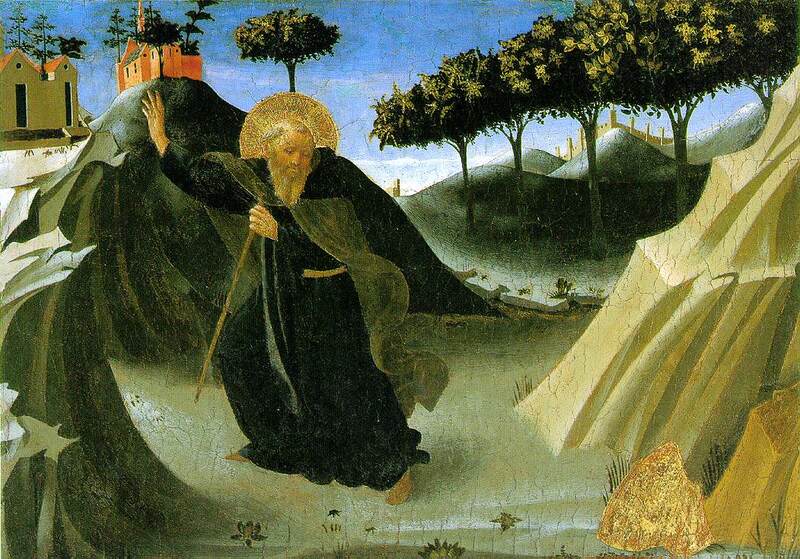 Then the priest comes outside and blesses the creatures in the name of Saint Anthony, patron of four-footed beasts. Let the cows out of the stable. Housewives give the boys such gifts as freshly baked cakes, apples, small rolls and eggs--sometimes a few coppers. The food is pooled for a jolly evening feast, followed by games and dancing. The money goes to the village schoolmaster who uses it, later, for a class picnic or excursion. 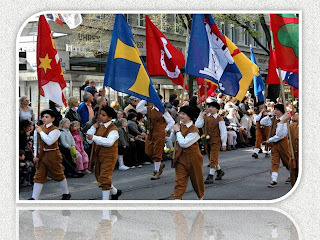 For over six hundred years the city of Zurich has symbolically driven out Winter and welcomed Spring with the traditional Sechselauten, Six Ringing Festival, which is observed on a Sunday and Monday early in April. The festival originated in the Middle Ages when the trade guilds governed the city. On the Monday following the spring equinox (March 21) it was customary for the cathedral bells to start ringing at six, instead of seven o'clock--the usual time--to announce the end of the guild member's working day. This first day of change from winter to summer schedule was celebrated as a guild holiday. For centuries the bells rang as a signal to cease work. Gradually the general public sought to join in festivities. Finally the Six Ringing, which started as a purely guild holiday, became an affair in which all of Zurich's citizens shared. The festival opens on Sunday with a school children's parade and pageant, followed on Monday by a splendid procession of the various guilds, some twenty-four of which still exist. The city presents a gala appearance with bunting, cantonal flags and pennants fluttering from houses and public buildings. Immense crowds from surrounding areas gather to see the procession. School children in regional costume precede a float on which is enthroned a pretty girl personifying Spring, surrounded by flowers, garlands, and numerous attendants. Then comes Boogg, traditional embodiment of Old Man Winter, whom the crowd boos and derides as he goes past on a moving platform. Boogg is a huge snow man, fashioned over a wooden frame and stuffed with firecrackers and explosives of all kinds. Boogg's attendants, in contrast to Spring's fair young companions, are a crowd of jeering, dancing clowns who stick out their tongues and add their own quips and insults to those of the spectators. Boogg is carried to the Bellevue Platz overlooking the Lake of Zurich. Lifted high on a pole above an immense unlighted bonfire, the personification of Winter awaits his fate at six o'clock on the following day. 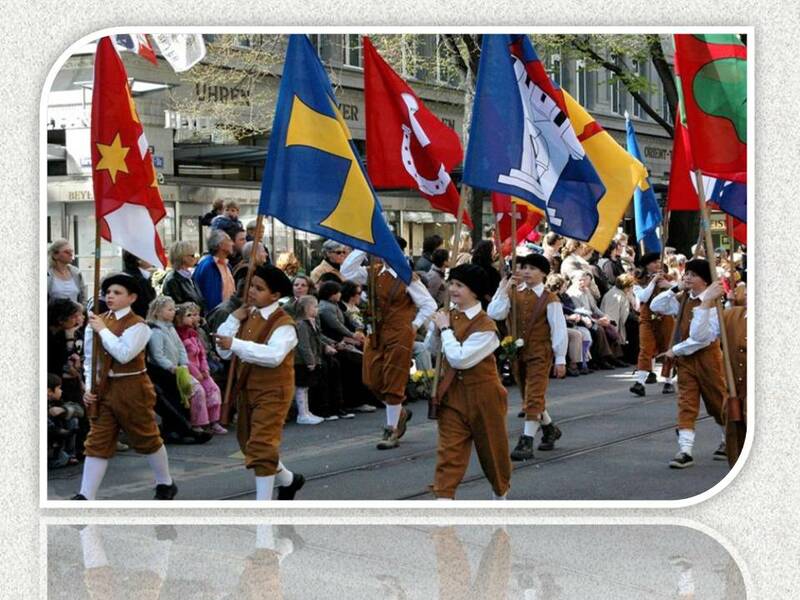 On Monday tradespeople and craftsmen from country districts come into Zurich to participate in the guild procession. Members of the barbers', bakers', hat makers', butchers', weavers', and other guilds are dressed in historic costume and carry the traditional symbols and standards of their various trades and professions. The barbers, for example, may carry a pair of scissors as tall as a house, the bakers toss rolls to the crowd, or the hat makers sport about a gigantic hat. All the capering and marching is accompanied by numerous bands, including the fifers and drummers for which the area is famous. The colorful procession proceeds before cheering crowds, marches along the banks of the Limmat and comes to Bellevue Platz, where Boogg is impaled above his pyre. Promptly at six o'clock the bells start ringing. Fife and drum bands play loudly the stirring Zurcher Sechselauten Marsch. The people shout with joy. The bonfire under Boogg is lighted. Suddenly the flames spring upward and the explosive-filled figure of the snow man ignites. White-robed horsemen gallop about the fire as firecrackers explode and parts of Boogg fly in all directions, amid a deafening roar of noise and confusion. Round and round the horsemen ride, forming a magic circle about Winter, to prevent his escape from the flames. The symbolic rite which has come down through the centuries from pagan times is one of Switzerland's many ceremonies to dramatize Winter's expulsion and universal joy in returning Spring. 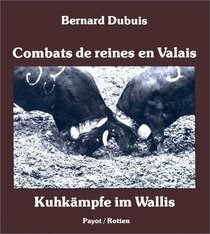 Organized cow battles are unique to the canton of Valais. Each spring during April the Queen Cow of the village herds is determined by pitting the cows against each other in battle. The cow that holds her own against all opponents and comes through the encounter victorious, is proclaimed Queen Cow of the year. Crowned with a flower garland between her horns and with the largest bell hanging from her artistically designed collar, the Queen Cow, acknowledged leader of the herd, walks at the head of the procession of animals that migrates annually to summer pasture in the mountains. 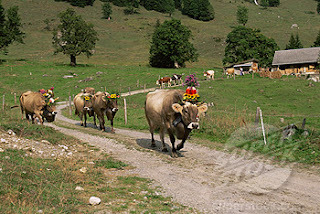 Alp Aufzug, the procession of animals driven to upland pastures in early spring, is a picturesque sight and a festive occasion in every valley hamlet. Every year the village men and older boys set out in early spring for crude mountain huts, situated at an altitude of six to eight thousand feet, to look after the cows and goats and make butter and cheese for autumn marketing. The women and children remain at home, tending crops and gardens and bringing in the hay. On the morning of the Alp Aufzug the whole village tingles with suppressed excitement. The air is filled with the barking of dogs and the melodious ringing of cowbells. Herdsmen dressed in vivid peasant costume, with flowers in their hats and, sometimes, a brass ring in one ear, assemble the long procession of animals for the slow march to the mountains. The sleek herds, each preceded by their flower-crowned Queen, wear garlands and gay streamers. Enormous bells swing from the collars of the choicest cows, while smaller, but no less musical bells, adorn the necks of the more humble creatures. Behind the cows, dogs and youths round up goats and sheep. Once in the mountains, these rugged smaller animals seek higher more stony pastures than the cows. At milking time the boys drive the goats down to the dairy hut and later join the older men in a simple supper of black bread, cheese, milk, and mountain fruits. The rear of the procession is brought up by flower-decked wagons, or sometimes by mules, laden with cheese molds, cauldrons, pans, and other necessary dairy equipment, as well as enough blankets and household articles to last through the summer. As the colorful procession of herdsmen and animals slowly starts from the village, good-byes are called, hands waved, a few tears shed; for girls will miss their sweethearts, women their men, and life in the mountain pastures is lonely and monotonous. 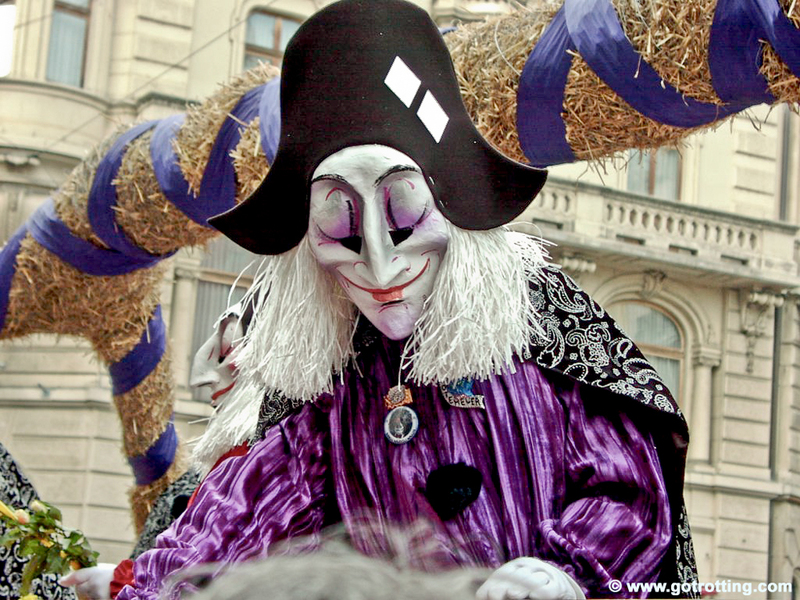 One of Switzerland's most magnificent spectacles is the Basel Carnival which opens in the market square at four o'clock in the morning with fife and drum performances by the bands of various companies. Just as Basel's clocks strike four lights go out all over the city. From every direction fifers, drummers and masked marchers in fantastic costume, pour into the square. In the procession that follows, four men in each group carry immense transparencies which, like many of Valencia's fallas, mercilessly satirize local politics and politicians. Other marchers carry colorful lanterns attached to the ends of long poles. The transparencies, like the fallas, are created in secret by professional artists. Later awards are given for the most unique or original contributions. At five o'clock the city lights are turned on, the fifing and drumming ceases and spectators hurry to inns and taverns to warm themselves with bowlfuls of the thick brown flour soup which is Basel's Carnival specialty. 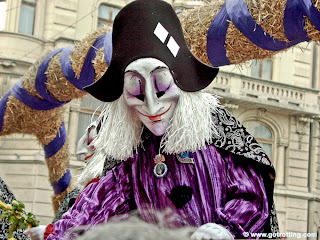 Carnival is celebrated extensively throughout the country, with each town and village following its own local traditions. At Flums, near the Wallensee, for example, celebrants in wooden masks (many of which are handed down from father to son for generations) parade through the streets. It is thought that these horrible and terrifying masks, some of which symbolize abstract ideas such as war, death or disease, originally were made to dissipate the very forces they so hideously represent. 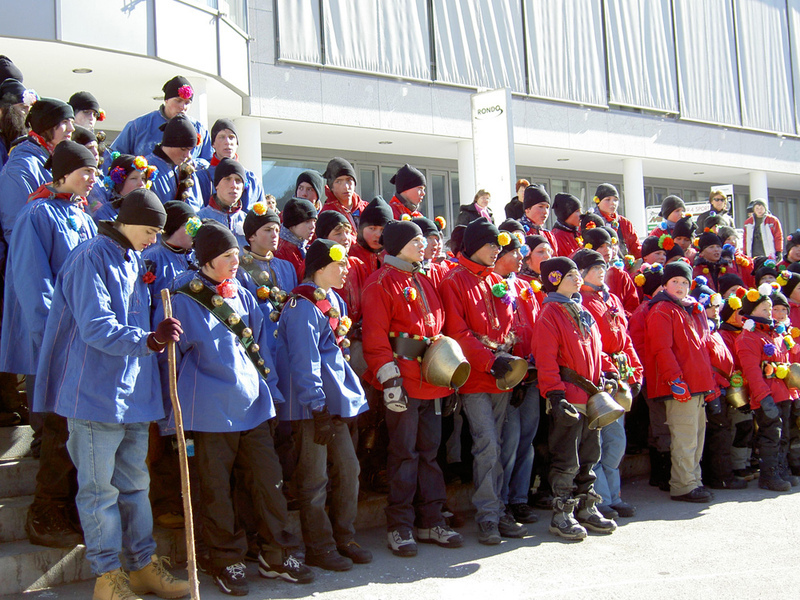 At Einsiedeln, in Schwyz, "Carnival Runners," wearing grotesque false faces and with enormous bells attached to their backs, run through the streets continuously from Sunday to Ash Wednesday morning. The bells, which are so heavy the men have to bend their backs to support the weight, clang incessantly as the Runners course through the town. This ceremony, like the masks of Flums, also survives from ancient times when primitive people "drove out Winter" with deafening noise and fearsome faces and "rang in" their welcome to the Spring.